The Canford School CCF has been venturing to Norway for some twenty years now; a significant number of them generously supported by the Ulysses Trust and the expedition has become somewhat of an institution with many cadets over the years describing it as the best thing they did at Canford. It was no surprise therefore that this year saw record numbers applying and given the maxim that “the weakest cadets stand to benefit the most”, all comers were taken. The party of 30 Canford cadets and three staff, together with 9 Wellington College Cadets and 2 staff plus instructors and a QM, the party totalled 53 in all. We arrived weary that first Sunday from the rigours of Ryanair at the Fjellstoge Hotel well after nightfall as temperatures of -28C encouraged us into our “hytte” and with no real clue of what awaited us the next morning, but we were in for a treat. 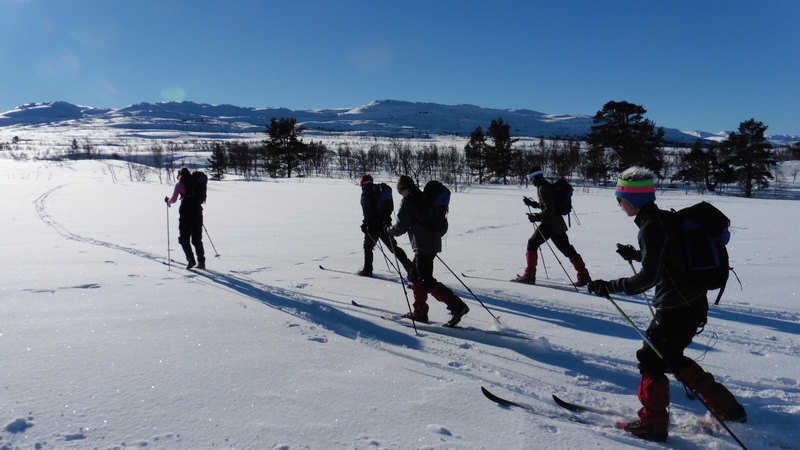 Monday dawned bright, cold and crisp and before we knew it the niceties of “fishscales”, “ski-waxes” or “skins” all became apparent as we clumsily break-danced our way around the local tracks of Hovden much to the amusement of the local Norwegians. We decided that they cheated anyway by harnessing up their dogs and being pulled along, but then any fool can work harder than he needs to. Snow-ploughing on back-country skis challenged us all and even those who claimed they could ski – downhill – were brought swiftly down to earth, literally, or should we say “to snow”. By the end of the day we had progressed, we felt meaningfully, having gone off-piste and found those beautiful wastes of silent sparkling snow amongst the stunted birch trees. Day one was the last we saw of the sun for the week sadly, but it left us with memories of just how incredibly beautiful Norway is. Days two and three, after varied warm-ups; one lucky group played rugby with a small bag on skis – diving around certainly warmed them up, saw us refining our skills and then embarking upon some snow survival training; emergency shelters, snow profiles, the use of transceivers, building Quincy shelters and some telemark skiing to make us feel like pros. The Wellington crew, being older, progressed swiftly and cracked over 25 km on day 2: a fine achievement. The afternoon on day three was set aside for packing and we carefully squeezed into our rucksacks every bit of down, wool and fleece that we could find, our rations and other bits and bobs and then finally as day four arrived we sallied forth to find out what lay beyond the hills. The climb up into the hills was not too much of a challenge until we reached the last hill just before the Tjornbrotsbu Mountain Hut: that certainly tested the “herringboning” skills as we walked up more like deformed penguins than anything else. However, the real work started on arrival there with the building of three massive Quincies; one housed our tallest cadet, Leo, and his size 14 boots, and even he could stand up inside it – it was positively palatial. 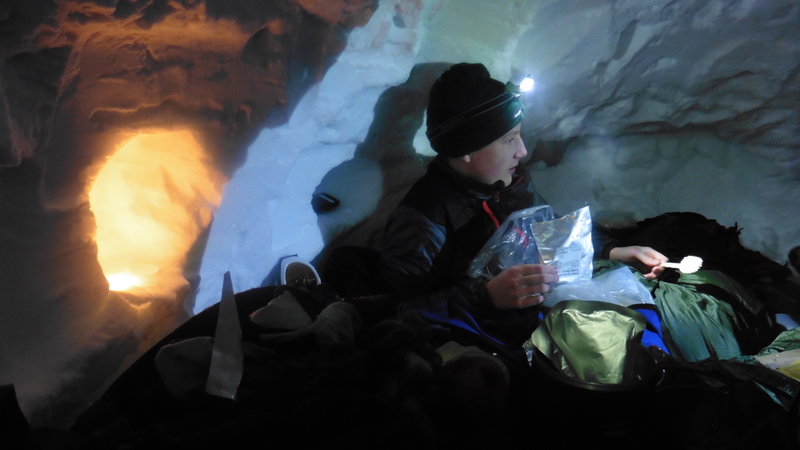 All of the shelters worked well and before too long we, staff included, were all tucked up in our bags and bivvies, down jackets and balaclavas firing up our jetboils and enjoying our soup and goulash in the muffled caverns lit eerily by flickering tea-lights. The first night saw three of our groups in Quincies whilst the other two groups were allocated the hut. 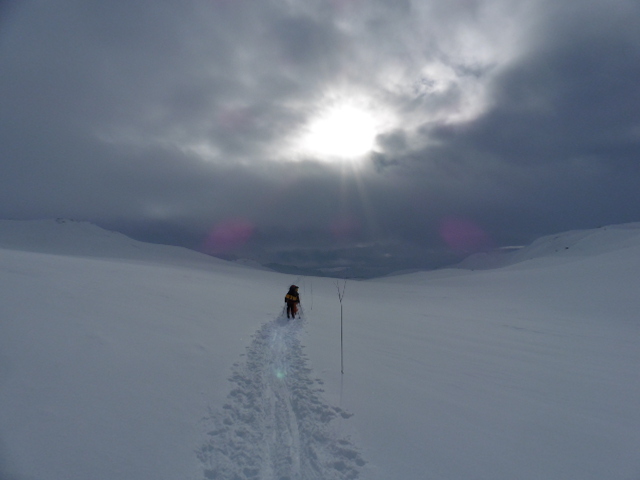 Sleep came quickly to some, less quickly to others, but we rose to a still morning with high cloud and vast swathes of empty whiteness before us. The hut dwellers left quickly in the knowledge that they had their ordeal ahead, but before long we were all on our way stepping and sliding, not effortlessly sadly, off into the emptiness. The hard-nuts pulling the pulks with our stoves and shovels loaded on board did a great job and despite two steep downhill slopes which often had us all wiped out at once – it is quite a challenge righting oneself on floppy skis with a 25 kg rucksack on board at an angle on a slippery surface – we made solid progress. Somehow we managed to cover the necessary ground and finally after what seemed a good long way we saw the little Berdalsbu huts across the valley which foretold a steep descent and then a final climb. Talk about a sting in the tail – both were equally challenging but we skied into the hut area much relieved only to have to knuckle down once more and set to helping dig the other two groups into their Quincies; one of which promptly collapsed and to make matters worse it started snowing hard whilst the wind was increasing. 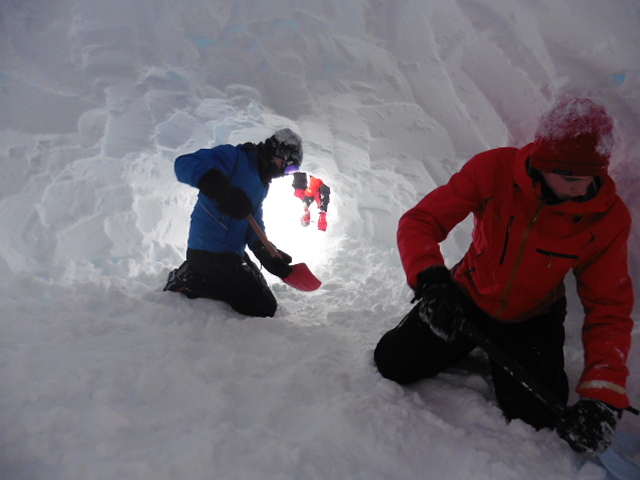 Two days in, with night falling, snow building up and tiredness creeping in we were all presented with a real challenge. Not to be outdone we dug on and eventually the two snowhole groups slipped into their white mounds whilst the rest of us retired excitedly to the mega-bunk in the hut. The wind continued to pick up, the snow to drift, but many of us were dead to the world. One Quincy seemed to have more snow drifting inside it than outside whilst the other, which had been rebuilt after its collapse during construction, was superb and it was this group under the fine leadership of Lt Col Paul Rothwell who were up and away first next morning, breaking trail through two feet of powdery snow. Cleaning up the huts was the next job, but eventually we were all away heading out on a short leg of about five kilometres to the road-head skiing through stunning birch groves and pine copses. 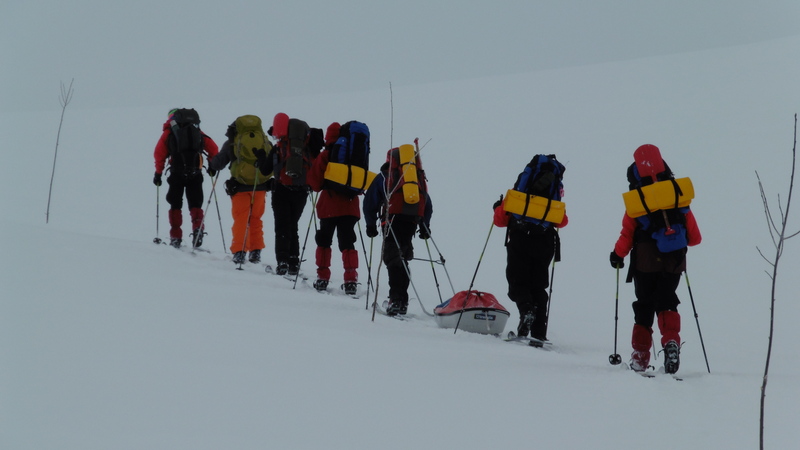 The Wellington College cadets had, after snow-holing overnight and then climbing a hill on day two of the expedition, returned to the Hotel in order to embark upon some ice-climbing on day three: “awesome, simply awesome” was one reaction. The road head and a welcome warm coach brought our adventures to a swift end as we all converged for the debrief sessions and an attempt to reflect on what we had learned; it had been tough, very tough, which for us aged 14 – 15 was a real challenge, but to embark on an expedition into the icy wastes of the Hardangervidda and survive was no mean feat and driving away on the final morning to return to Canford the hills that we had survived in certainly looked grey and foreboding – did I go there and survive was the simple question which we could not really quite believe. But we all learned much more than doing just that; pushing oneself, supporting and encouraging others, determination, courage to push on, what it is like to have someone in the group who does not contribute and what respect others get by selfless commitment and generosity were amongst our other lessons. Yes, and learning to ski too, but it was all a truly great experience and our thanks go to those who supported us and especially the Ulysses Trust Fund for their generous support.